Build a custom sofa to pair perfectly with your distinct style of decor. 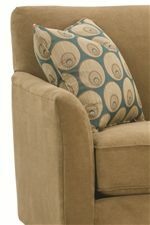 Add style accents of your choice to complete the clean base, made with attached back cushions and flair tapered arms. Options include a choice between three-over-three or two-0ver-two cushions, tapered block or turned wood legs, and optional nailhead trim in pewter or brass. Standard cushion fill is 300CC high density foam, but Extra Firm or Feather Soft cushions are available for an additional charge. The Varick-RXO Customizable 82" Sofa by Rowe at Reeds Furniture in the Los Angeles, Thousand Oaks, Simi Valley, Agoura Hills, Woodland Hills, California area. Product availability may vary. Contact us for the most current availability on this product. Wood & Finish Leg finish options are Washed Pine, Chestnut, Americana, Espresso, Latte, Porcelain (upcharge), Honey, and Cherry. If finish is not specified, the most popular finish, Espresso will be selected. Padding & Ergonomics Our standard 300cc cushions are made with a high-resiliency polyurethane foam core wrapped with a layer of soft polyester fiber. High-resiliency (HR) foam is important because it delivers the right amount of support, sink-in comfort and bounce-back. The polyester wrap provides surface softness and shape. Sometimes the cushions are bagged to create a cushion with less crown. Extra Firm or FeatherSofa cushions available for an additional charge. The Varick collection is a selection of furniture designed by you and built right here in America by skilled craftsmen. From the feel of the cushion down to the accent trim, everything you want on your sofa is up to you. Once you choose the cushion style and comfort, you can then choose between modern tapered block legs or more traditional turned wood legs. Nailhead trim is also available, in pewter or brass finish. A huge variety of upholstery fabrics is available to help you best match your sofa to your decor. The Varick collection also includes chair, loveseat (not shown), Queen sleeper sofa, and sectional sofa customized to your taste. The Varick-RXO collection is a great option if you are looking for Transitional Contemporary furniture in the Los Angeles, Thousand Oaks, Simi Valley, Agoura Hills, Woodland Hills, California area. Browse other items in the Varick-RXO collection from Reeds Furniture in the Los Angeles, Thousand Oaks, Simi Valley, Agoura Hills, Woodland Hills, California area.